Today was a very historic day at Coastal Carolina. After much talk, rumor, and anticipation, the big announcement was finally made to confirm that the college I work for would join a new conference. However, this wasn’t a lateral move or a charade to jump off of a sinking ship. Rather, It was a move that offered great testament to the stature, progress, and potential of Coastal Carolina University. It was announced at this afternoon’s press conference that our institution would join the Sun Belt Conference (effective July of 2016). As I mentioned, this just isn’t our university jumping from one conference to the other…it is so much more. By making this move, Coastal Carolina is now an FBS school. Or, in another words, CCU is now at the big boy table. 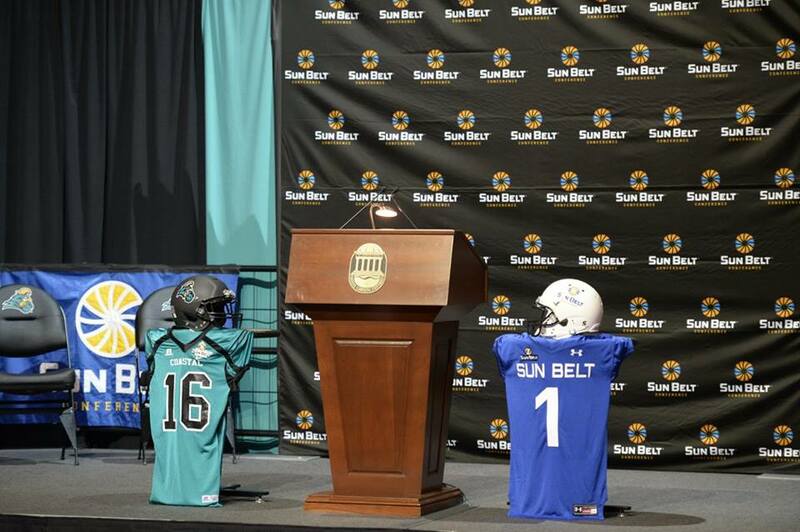 Today the announcement was made that Coastal Carolina University would join the Sun Belt Conference (photo courtesy of Bill Edmonds, Coastal Carolina University). It is no secret, Coastal is a university that is on the rise from just about every aspect. With the insane growth, exposure, and recognition consistently generated by our college it made sense to take an offer that will multiply all of these great things even more. 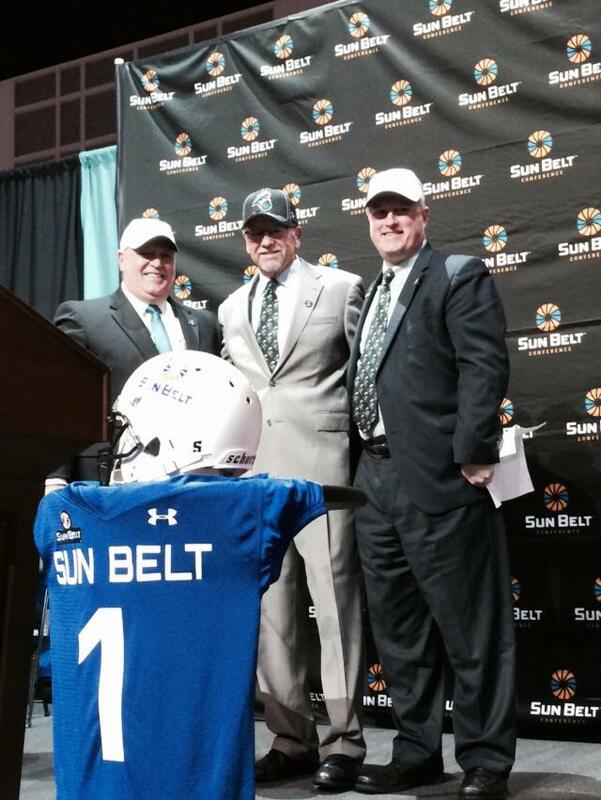 The Sun Belt naturally wanted the Chanticleers and our administrators made the strategic move to accept the invite. Commissioner Karl Benson said today that the decision to add our university was a “student-athlete decision.” This is exactly how it should be. Of course Coastal has the facilities, the structure, and the means to be a perfect fit but in the end it all comes down to the student-athletes. To know that our students who come here to compete for the Chanticleers will have a solid conference to compete in is comforting. I snapped this photo with my phone today of President David DeCenzo, Sun Belt Commissioner Karl Benson, and Athletic Director Matt Hogue during the press conference. From a complete selfish standpoint, I am so jacked up about this move. To say that I now work for an FBS school (or at least a transitioning FBS school) as opposed to an FCS school makes me feel good. Whether or not you want to admit it, there is no better place to be than at the highest level of competition. 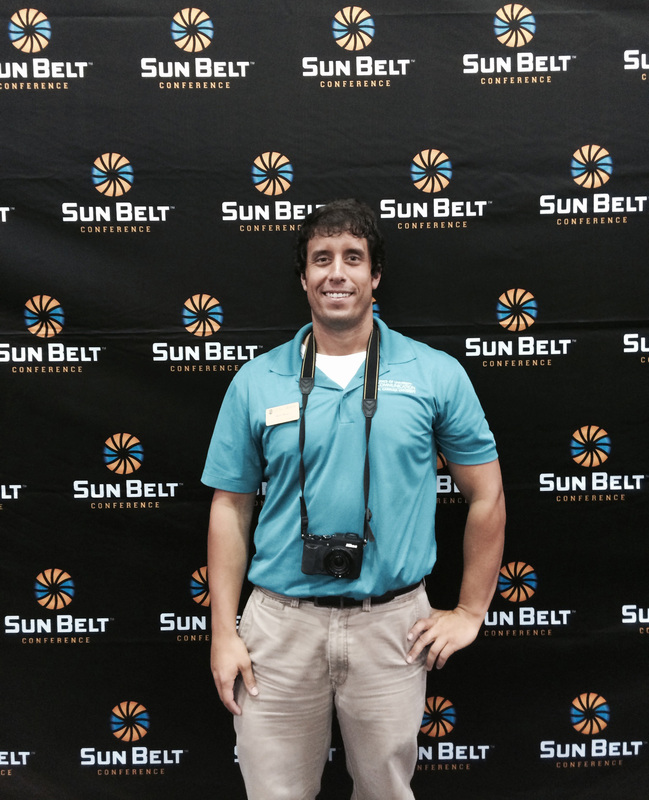 I am so pumped that the college I work for is going FBS and joining the Sun Belt Conference. When I was working in the athletic department at Montana an invite was offered to join the Western Athletic Conference (WAC). The move would have taken the Griz to the FBS level as well. The president opted not to accept. I remembered feeling so disappointed that the program would remain at the FCS level in a less than glamorous conference. Now the WAC ended up dissolving its sponsorship of football so perhaps the right decision was made but who knows what would have happened if Montana joined and added stability. Bottom line, I am glad I don’t have the bad taste in my mouth of not moving up again. Coastal Carolina can undoubtedly prosper at this next level. In fact, most of our athletic programs are already succeeding at this level through membership in the Big South Conference (besides football, our other sports play in the top tier NCAA championships). But the move to the Sun Belt will be a complete game changer. The switch in conferences will bring a sizeable boom that will bolster our athletic program and campus like nothing we have seen before. I give much credit to President DeCenzo and Athletic Director Matt Hogue for making this all happen. If you can believe it, Coastal Carolina University has now become an even more desirable place to go to school and to work at. Go Chants! Don’t Blink. This entry was posted in Uncategorized and tagged Coastal Carolina joining Sun Belt Conference, Coastal Carolina University, Commissioner Karl Benson, Matt Hogue, President DeCenzo, Sun Belt Conference by brent. Bookmark the permalink.